Adolph Metzger was born in Balingen, Wurtemberg, Germany about 1834. He immigrated to the United States as a young man and settled in Philadelphia, where he worked as a laborer. On May 29, 1855, he was enlisted into Company C, Regiment of Mounted Rifles by Lieutenant Burns. His enlistment documents describe him as 21 years of age, 5’ 5” tall, with brown hair, blue eyes and a dark complexion. After service with his regiment in the southwest, he was discharged at the expiration of his enlistment at Hatch’s Ranch, New Mexico as a private on May 29, 1860. Civilian life apparently didn’t resonate with Adolph, and he re-entered the army a few months later. On November 14th he was enlisted into Company C, 2nd U.S. Cavalry by Lieutenant Wilkins as a bugler. He was working in Newport, Kentucky as a laborer at the time of his enlistment, and it is unclear whether he was east- or westbound at the time. Miraculously, he aged only three years in the five and a half years since his first enlistment, listing his age as 24. He served through the various campaigns of the Civil War without major incident, and was discharged the day prior to his third enlistment at Light House Landing, Virginia shortly after the regiment’s return from the battle of Trevilian Station. Bugler Metzger was enlisted into Company C, 2nd U.S. Cavalry by Lieutenant Robert Lennox on July 12, 1864. Although he had grown three inches since his last enlistment, he had aged only a single year. A few weeks later, probably during a furlough granted due to his reenlistment, Adolph married Fredericka Cooper. The ceremony took place on August 2nd, at the German Evangelical Church in Washington, D.C. The bride was only 15 or 16 at the time of the wedding, and Adolph apparently did not inform his parents back in Germany of his changed marital status. He remained with his company through the end of the war and its subsequent recruiting and refitting in Maryland. When the regiment moved west in October 1865, his wife remained behind. Due to the numerous changes of post and their attendant dangers, this was probably a wise choice. In November 1866, the company was assigned to Fort Phil Kearny, Dakota Territory, in present day Wyoming. Second Lieutenant Horatio S. Bingham was the company’s commander and sole officer for the assignment. Bingham, who had served as a captain in the 2nd Minnesota Cavalry during the Civil War, had been appointed an officer in the regiment in February. Lieutenant Bingham was killed in an engagement with Indians on December 6, 1866 when he and a small group of soldiers were decoyed away from the main body while attempting to assist a woodcutting party which was under attack. On December 21st, twenty six members of the company, including Bugler Metzger, rode out of the fort to assist another woodcutting party. A mixed party of infantry and cavalry sortied from the fort under the command of Brevet Lieutenant Colonel William J. Fetterman. The force was drawn into a trap out of view of the fort and wiped out in less than twnety minutes by over a thousand Sioux and Cheyenne warriors. The only survivor was a gray cavalry horse named Dapple Dave, badly wounded by both bullets and arrows. The horse was probably Metzger’s, as it was the practice in that unit to mount buglers on white or gray horses to make it easier to find the commander during a battle. Metzger was one of only two soldiers whose body wasn’t mutilated by the victorious Indians. 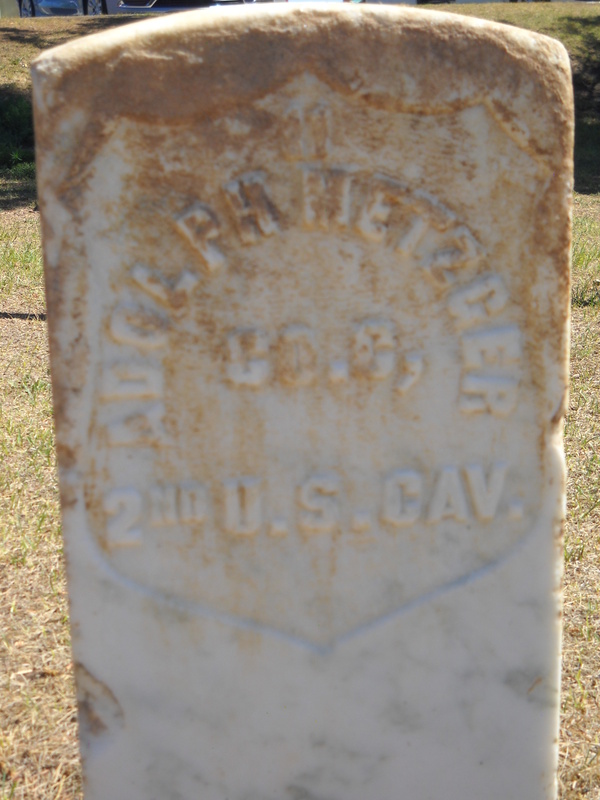 The other was Sergeant James Baker, also a Civil War veteran of Company C. According to several verbal accounts from Indians who participated in the battle, Bugler Metzger fought to the very last. Once his ammunition was exhausted, he continued to fight using his bugle as a bludgeon until overcome. The bugle is now part of the collection of the Jim Gatchell Memorial Museum, who very kindly granted me one-time permission to publish a photo with this post. It was found around 1935 by early homesteader Christian Hepp, who ran cattle near the grounds of the ruins of the fort. Since Metzger was the only bugler in the expedition, it seems extremely likely that it was his. Photo courtesy of Jim Gatchell Memorial Museum. The dead from the fight were brought back to Fort Phil Kearny, and initially interred there. After the fort was abandoned and when Custer National Cemetery was created at Little Big Horn, they were moved there. They now lie there in graves numbered 15-49 and 108-144. Metzger’s wife Fredericka drew his pension. This was later disputed by his mother, who contacted the American consulate in Stuttgart to press her claim. She maintained that Adolph could not possibly have been married without informing his family in Germany. Her claim was later rejected. 1. One account from a soldier in Company C mentions a man named Footer as the company’s bugler, but there was no such person assigned to the cavalry company or the 18th Infantry at the post at this time. Since the account was written several years later, it seems likely he confused the name of the bugler. Some accounts describe the bugler as a teenager, but there’s no evidence to support this. 2. 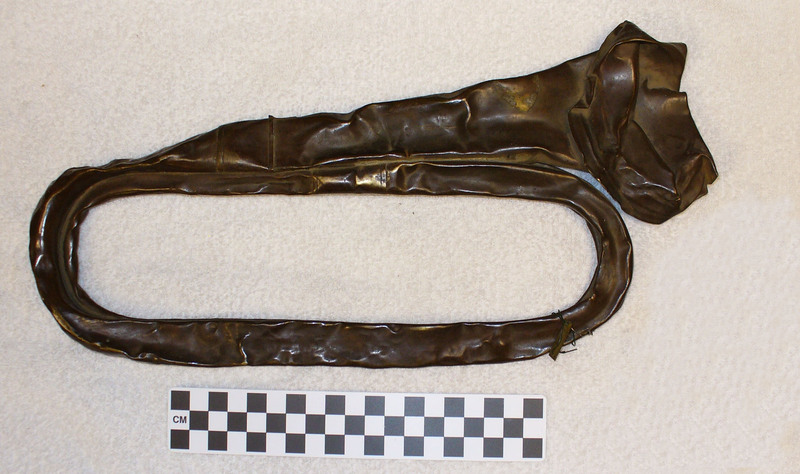 Historian John H. Monnett maintains that the story of Metzger and the bugle is apocryphal. For more information, see his very detailed book Where A Hundred Soldiers Were Killed. He makes a very strong case. Brady, Cyrus Townsend. Indian Fights and Fighters. Lincoln: University of Nebraska Press: 1971. Fort Phil Kearny/ Bozeman Trail Association. Portraits of Fort Phil Kearny. Banner, WY: 1993. Guthrie, John. “Fetterman Massacre,” Annals of Wyoming 9 (October 1932): 714-718. Accessed via Internet Archive on August 30, 2015. Monnett, John H. Where A Hundred Soldiers Were Killed. Albuquerque: University of New mexico Press, 2010. National Archives, Record Group 94, Civil War Widows Pensions. Accessed via Fold3.com on August 30, 2015. Utley, Robert M. Frontier Regulars. Lincoln: Univeristy of Nebraska Press: 1973. Watson, Elmo Scott. “The Bravery of Our Bugler is Much Spoken Of,” Old Travois Trails 1 (1941): 139.